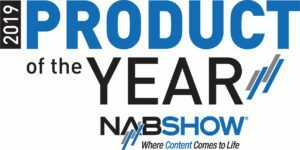 Recently we’ve seen a new breed of television formats. As high-resolution camera’s become more and more accessible and as you can now avoid shipping discs by using a modern workflow, the cost of shooting material has never been lower. Docusoaps and similar formats are produced using sheer unlimited volumes or raw material and more spontaneously shot material. In turn, the cost of logging all that material becomes an more important factor on the budget. Conventional logging and transcription requires 10 hours or more of manual processing to transcribe, describe and classify the material. We’ve carefully listened to our customers and created an innovative solution for “Computer Assisted Logging”. It dramatically speeds up the material intake and selection processes, enabling you to process larger volumes of content within the same budget. By far the most important time-saver during logging is machine transcription. 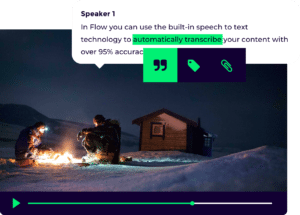 Using speech-to-text technologies, Limecraft Transcriber turns audio into printed text fragments. All words and segments are exactly time-coded, overall saving 50% time required for material intake. In a second pass, material is reviewed and formally logged by director’s assistants or researchers. 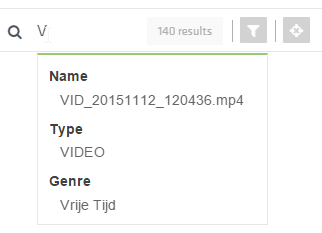 To them, we offer a new approach to create, annotate, assign and share parts of a clip. Using shortcuts to efficiently walk through the sections of the clip, they can describe what then see. The result can be displayed both on the timeline as well as on the canvas mentioning a specific region of interest. During logging, you can make subclips by setting in and out points during playback. More importantly, you can now use ‘#’ or ‘@’ to add tags, or referring to a colleague. No matter how good the material has been logged, making a selection of fragments and quotes when starting from hundreds of hours of content is a challenge. It is like finding the needle in the haystack. An intelligent search box allows you to intuitively and rapidly narrow your selection. When you start typing a keyword, the search engine will assist you in making the right selection. As soon as you ask the library to search for a particular term (say “diet”), we not only show you a selection of clips and subclips where this particular terms is used, but we show on a timeline where exactly the term is being used. 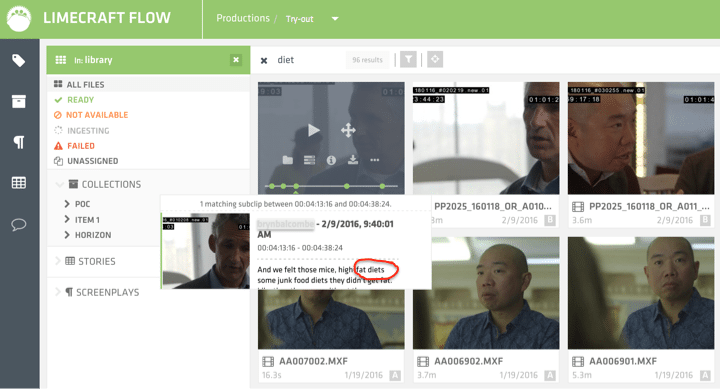 By using Limecraft Flow, the user can make a pre-cut of eligible fragments and quotes without having to watch the entire selection back-to-back. When searching for content fragments on a particular topic or to make a selection of quotes, researchers and documentary makers report being able to process five times the amount of material in the same timeframe. Eventually the purpose of logging and selection is the creation of a new story. 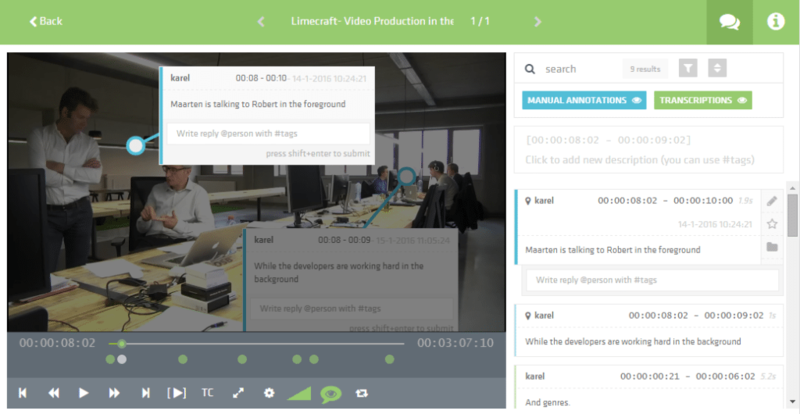 Using Limecraft Flow, you can intuitively assemble your storylines by dragging and dropping your subclips with ease. 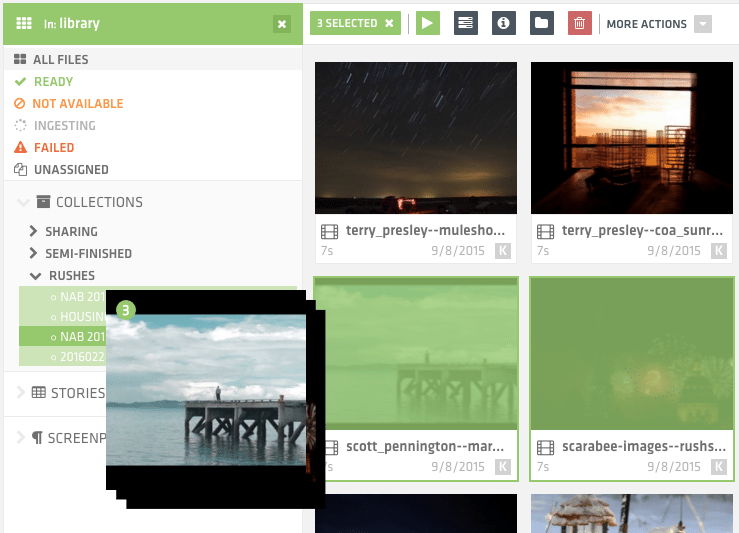 Collections can be easily and securely shared with colleagues or third parties for review, or they can be exported by the editor to any edit software of choice. Now what – can I give it a try? It’s easy. Have a look at our website and signup for a free try. We hope to meet you soon and we welcome all comments or suggestions!